Renjun Duan and Hongjun Yu, The relativistic Boltzmann equation for soft potentials. Advances in Mathematics, 312 (2017), 315-373. Renjun Duan, Feimin Huang, Yong Wang and Tong Yang, Global well-posedness of the Boltzmann equation with large amplitude initial data. Archive for Rational Mechanics and Analysis, 225 (2017), no. 1, 375-424. Renjun Duan, Yuanjie Lei, Tong Yang, and Hui-Jiang Zhao, The Vlasov-Maxwell-Boltzmann system near Maxwellians in the whole space with very soft potentials. Communications in Mathematical Physics, 351 (2017), no. 1, 95-153. 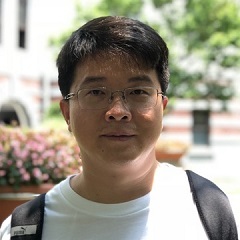 Renjun Duan, Shuangqian Liu and Jiang Xu, Global well-posedness in spatially critical Besov space for the Boltzmann equation. Archive for Rational Mechanics and Analysis, 220 (2016), no. 2, 711-745. Renjun Duan, Global smooth dynamics of a fully ionized plasma with long-range collisions. Annales de l'Institut Henri Poincare -Analyse non lineaire, 31 (2014), no. 4, 751-778. Renjun Duan and Shuangqian Liu, The Vlasov-Poisson-Boltzmann system without angular cutoff. Communications in Mathematical Physics, 324 (2013), no. 1, 1-45. Yoshihiro Ueda, Renjun Duan and Shuichi Kawashima, Decay structure for symmetric hyperbolic systems with non-symmetric relaxation and its application. Archive for Rational Mechanics and Analysis, 205 (2012), no. 1, 239-266. Renjun Duan and Robert M. Strain, Optimal large-time behavior of the Vlasov-Maxwell-Boltzmann system in the whole space. Communications on Pure and Applied Mathematics, 64 (2011), no. 11, 1497-1546. Renjun Duan and Robert M. Strain, Optimal time decay of the Vlasov-Poisson-Boltzmann system in $R^3$. Archive for Rational Mechanics and Analysis, 199 (2011), no. 1, 291-328. Renjun Duan, Alexander Lorz and Peter Markowich, Global solutions to the coupled chemotaxis-fluid equations. Communications in Partial Differential Equations, 35 (2010), no. 9, 1635-1673. Renjun Duan, Massimo Fornasier and Giuseppe Toscani, A kinetic flocking model with diffusions. Communications in Mathematical Physics, 300 (2010), no. 1, 95-145. Renjun Duan, Seiji Ukai, Tong Yang and Huijiang Zhao, Optimal decay estimates on the linearized Boltzmann equation with time-dependent forces and their applications. Communications in Mathematical Physics, 277 (2008), no. 1, 189-236.